TORONTO, ON--(Marketwired - Sep 13, 2017) - Amfil Technologies Inc. (OTC PINK: AMFE) is pleased to announce that the first franchised Snakes & Lattes Inc. board game café and bar, will be opened in Hamilton, Ontario, Canada. The opening of the Hamilton franchise is planned for Q1 2018. This will mark the Snakes & Lattes' official extension into the franchising of its retail division, and will be the first franchise to contribute to the plans for mass expansion and will form the template for future Snakes & Lattes Inc. franchise locations throughout the North American markets. Snakes & Lattes Inc. currently operates in 3 divisions: Wholesale Distribution, Game Publishing, and the Retail Division which currently runs two thriving in-house locations in downtown Toronto, Ontario with the third and largest location, "Midtown" set to open in the coming weeks. The Hamilton, Ontario franchise will mark the fourth Snakes & Lattes Inc. location. Hamilton, Ontario, is a Canadian port city with a population of approximately 536,000 and a CMA population of approximately 778,000. The city is located on the western tip of Lake Ontario, an approximate 1 hour drive from downtown Toronto. Hamilton is the home to a thriving social scene, fueled by a number of post secondary educational centres such as, McMaster University, Redeemer College, and Mohawk College. These factors contribute to Hamilton having the ideal conditions and demographics to support a successful Snakes & Lattes Inc. location. This location was selected as the first franchise due to its close proximity to the existing, corporate Snakes & Lattes Inc. locations. This location will allow the management team to oversee the development process from start to finish, and to work hand in hand with the new franchisee to ensure a synergistic reflection of the current business model. The close proximity will also allow Snakes & Lattes to utilize their current staffing resources, including the specialised 'Game-Gurus', for the purpose of training, support, and the ongoing marketing and development of the brand. The Hamilton franchise will be modeled after the Snakes & Lattes Midtown location, with regard to design aesthetics. The exact opening day for the 'Midtown' location will be announced shortly. The opening date for Snakes & Lattes Midtown has been moved to October to allow for the install of new infrastructure that will allow the location to operate beyond its anticipated volume. This decision was made by management to allow for future growth beyond current expected capacity and to prevent any delays after opening to accommodate the potential growth. Snakes & Lattes Inc. is extremely excited to have taken such a vital step towards fueling the brand's aggressive expansion throughout the North American market. The franchising of the brand will expedite the increased revenue and profits contributing to the company's financials, and in turn exponentially increase value back to our shareholders. Further details relating to the franchising of Snakes & Lattes Inc., including the new Hamilton location will be communicated as the project develops. We would like to take this time to thank our shareholders for their continued support throughout this exciting time in the company's history. For more information regarding Amfil Technologies Inc., please visit www.amfiltech.com and follow us on Twitter for further updates @AmfilTech. 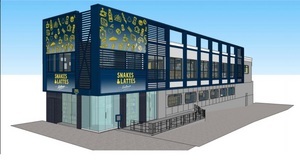 For more information on Snakes & Lattes Inc. please visit www.snakesandlattes.com and for franchise related inquiries please contact investors@snakesandlattes.com. 1). Snakes & Lagers Inc. holds the trade name and is the owner of Snakes & Lattes Inc. which currently operates a 6,000 sq. ft. and a 7,500 sq. ft. tabletop gaming bar and cafe located in Toronto, Ontario that brought in over $7M CAD in revenue last year. It is in the process of opening a third location at 10,000 sq. ft., the largest to date. Snakes & Lagers Inc. is also the procurement officer of all existing and future Snakes & Lattes Inc. franchises and has the exclusive rights to sell franchise locations globally. Snakes & Lattes Inc. was the first board game bar and cafe in North America, is believed to be the largest in the world and have the largest circulating public library of board games in North America for customers to choose from. Snakes & Lattes Inc. currently has a 90 member staff and recently acquired the exclusive distribution rights throughout Canada for some of the most popular board games in the world such as Cards Against Humanity and Exploding Kittens. BlogTO.com recently named Snakes & Lattes Inc. the best late night cafe in Toronto and has also been named the best fulfillment house in Canada by Jamey Stegmaier, the most influential blogger within the board game fulfillment sphere. For more information on Snakes & Lattes Inc. feel free to visit the website at www.snakesandlattes.com. 2). The EcoPr03 GRO3 Antimicrobial System was jointly developed between Amfil Tech and A.C.T.S. Inc. which recently rebranded its technology under Advanced Ozone Integration as an extension of the existing ozone technology being utilized in the food and beverage industry and integrated by A.C.T.S. into companies such as Pepsi, Nestle, Sysco, Sun Pacific and many others. The system is a triple-function sanitization unit capable of naturally eliminating 99.9% of water and airborne pathogens and the typically problematic pests that wreak havoc for cultivators (like aphids, whiteflies and spider mites), as well as bacteria, fungus, microbes and mold on surfaces, all without chemicals. The unit can also constantly regulate a given facility's water supply, oxygenating the water and maintaining a consistent PPM infusion of ozone that prevents the formation of algae, bacteria or mold (allowing for comprehensive water recycling), simultaneously removing the need to use pesticides and/or dangerous, often carcinogenic products to treat production problems, as is common throughout the industry today. This environmentally-friendly solution also eliminates odors, while slightly reducing the air temperature, lowering energy consumption by the HEPA filtration and HVAC systems and could potentially allow for a facilities process to be labeled certified organic in the U.S.A. when the crop is no longer considered illegal on the federal level, otherwise "Clean Green" or "Certified Kind" in the meantime. The EcoPr03 GRO3 Antimicrobial System recently passed product review by a registered USDA certifying agent for use in California as well as Pennsylvania and surrounding states. More information on this product line can be found on the www.grozone.biz website or on twitter @GRO3Systems.